Dragon Quest X is an MMO? That's unexpected. Word that the game is going to see an NES edition however is just baffling. 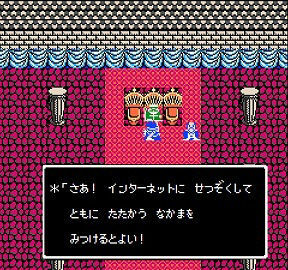 According to the Kyoko Shimbun (no relation to the Kyoto Shimbun), the game is also planned for release on the Famicom. This is the Japanese equivalent of the 8-bit Nintendo Entertainment System. Alongside this confusing news, the Kyoko Shimbun, also provided two screenshots from the neo-retro iteration of Square Enix's latest roleplaying epic. The first, featuring a familiar Dragon Quest foe can be seen here, while the second is embedded above. Furthering this diabolical mystery is that the embedded image seemingly asks players -- who, again, are playing this thing on some version of the Famicom -- to connect to the Internet. How, you may ask? I have no idea. Andriasang guesses that this sort of connectivity must be possible by playing the game in emulated form on a Wii or WiiU console, though that doesn't really explain any of the baffling "Whys?" swimming through my brain. Why would Square Enix port a game in its most crucial franchise to a 25-year-old dead console? Why would said port include code for features that the dead console is unable to support? Why couldn't Dragon Quest X just be a brilliant handheld game like its immediate predecessor? I'm tempted to chalk this whole thing up to a weird hoax or specifically Japanese memetic thing that I don't get because I'm on the wrong side of the Pacific, but that only spawns another "Why?" Specifically, why would anyone go to the trouble of convincing the Kyoko Shimbun writers that an upcoming videogame is also going to appear as a completely illogical retro throwback with features that make no sense in any context? Hopefully Square Enix will clear this whole thing up before I start crying.